One of my greatest delights as Chancellor of UIS is spending time with friends of our university, many of whom are Springfield residents who are grateful for the presence of the Springfield campus of the University of Illinois and who provide support for our campus through their gifts. One of those very special friends and supporters is Evelyn Brandt Thomas. 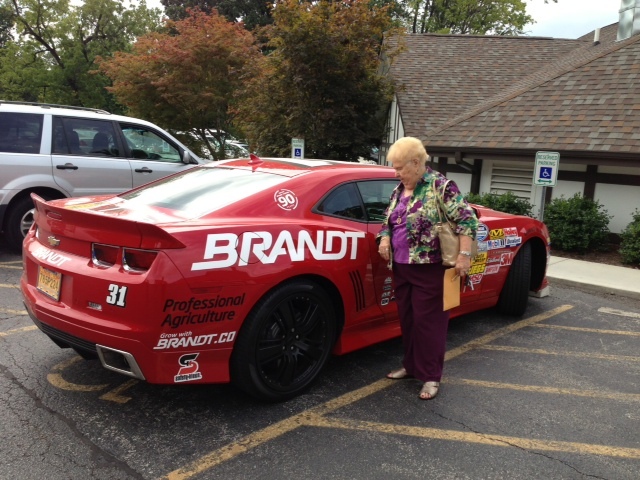 Evelyn and her brother, Glen, founded and developed Brandt Consolidated, a highly successful agricultural business in Central Illinois that is one of the largest employers in Springfield. 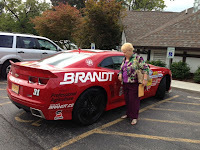 We celebrated Evelyn's 90th birthday a few weeks ago and here she is standing next to her birthday present – a replica of the race car that her company sponsors on the NASCAR circuit. It's not often that you see a car like this in "Handicapped Parking"! Evelyn is truly an inspiration – not only a builder of a successful business, but a generous philanthropist with a special appreciation for young people. Thank you, Evelyn, for all that you do to support UIS.